About a week ago I decided it's time. Time to whip myself back into shape. I miss being healthy, it's a night and day difference. When I'm in shape I have energy pre-cup of coffee, I sleep well at night and it's so much easier to pop right up at my alarm. Being in good health also helps with my overall outlook on life. I feel more content and joyful. I've decided to take the slow and steady route of getting there though. I'll flake out in a week or two if I get overly ambitious. So instead of pushing myself to do 30 minute cardio routines and only eat salad (yeah right! ), I'm trying to do something active every day, even if it's just going for a walk. I'm choosing to eat less bread, drink more water and eat more "power foods" (food that's got a lot to offer). Avocados. They're a good source of fiber, potassium, and vitamins C, K, folate, and B6. Plus they're delicious and make for an easy snack, even if just with a little salt. Cabbage. I've always loved cabbage but I didn't realize until recently how much it has to offer, plus it's cheap! It's a good detoxifier and is rich in iodine, vitamin E, calcium, magnesium and potassium. Here are some tips for cooking cabbage. Oatmeal. As I'm sure many of you know, oatmeal (not the instant kind, the real deal) is the way to start your day. Oats are a good source of soluble and insoluble fiber and nutrients, including: vitamin E, zinc, selenium, copper, iron, manganese and magnesium. It's also a good source of protein. Whew. I change my oatmeal up with different fruit each morning so I don't grow tired of it. Spinach. I like substituting different types of lettuce for spinach whenever possible because this stuff is no joke. Just picture Popeye and you'll get the right idea. It's loaded with calcium, folic acid, vitamin K and iron. It's also rich in vitamins A, C, fiber and carotenoids. 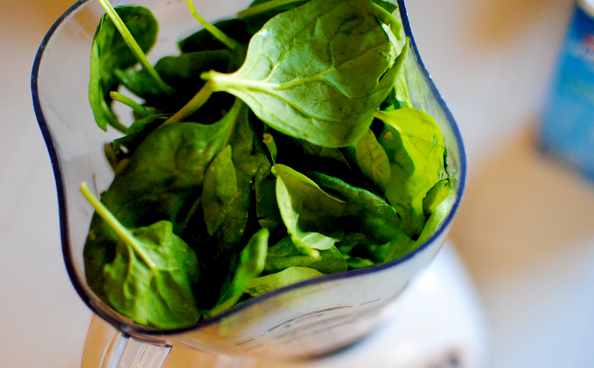 When Kurt and I were visiting friends in Ireland they shared a really awesome spinach smoothie recipe with us, it's so delicious, try it! Yogurt. I love having yogurt as a mid-day snack. It's a rich source of calcium and is easier for your body to digest than milk. It also has protein and live-culture yogurt helps boost your immunity with lactobacteria (basically, good bacteria that your body needs). And of course, Fruit. I'm eating more citrus pieces, bananas and apples whenever I have a hankering for a munchy. I'm also drinking Nettle Tea every day. Sounds strange but it offers so many benefits and doesn't taste bad either. It's a natural diuretic (helping reduce water retention) and cures inflammation. It helps eliminate acne and to regulate a women's cycle and reduce pain during it. You can read all about it here. I'm curious how you enjoy any of the above. Do you have a good recipe for cabbage or spinach? I want it! Are there any other foods you consider a must in your diet? To be honest, this is the first time I'm really taking it upon myself to be educated about what I eat (in college I was concerned with how I was going to pay for food, not what was in it). I'd love some help! Green smoothies are great. And kale! I love raw kale in pasta. Also, roasting any of the brassicas makes them delicious - we especially love roasted brussels sprouts. Broccoli sprouts are really tasty and are also a great sub for lettuce. One of my things is that I don't eat/drink low fat anything, like yogurt or milk. I've read a few things now saying that the full fat versions are much healthier for you, and that intuitively makes sense to me because of the rise in obesity and heart-related illnesses (of course I realize that could all be due to other causes). Unfortunately, full fat plain yogurt is becoming increasingly difficult to find. LA, I can always count on you for insightful comments about food. I haven't tried kale before but I've been hearing a lot about it recently. I don't ever seem to notice it in stores though. Guess I'll have to keep a better eye out for it next time I go. What you're saying about low and fat free milks and yogurts seems to make sense to me. I know Onken yogurt has live bio cultures, but it's fat free...hmmm...I need to do more research on this. Oh dear. Well, if I'm not eating food, I'm probably thinking about it. I haven't had any trouble finding kale in stores here - maybe it's not as popular in the UK? As for yogurt, most commercially available stuff has live cultures, so that part isn't too difficult to come by. If you can find Liberte Mediterranee yogurt, it's amazing! I've also just gotten a packet of chia seeds which I'm excited about trying out. We'll see if they live up to their hype. Oh dear. Well, the truth is, when I'm not eating, I'm thinking about eating (or thinking about what I might want to make next)! As far as I know, most commercially available yogurts (at least here) have live cultures, so that part's not too hard to find.